--Text from Mutiny and Romance in the South Seas: A Companion to the Bounty Adventure by Sven Wahlroos. Used by permission. See Book Recommendations for more information about this book. 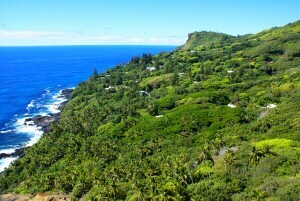 Pitcairn Island, looking towards the village of Adamstown with Ship Landing Point in the distance. © Andrew Christian (andrew@christian.pn). Used by permission. ADAMSTOWN Name of the center of the settlement on Pitcairn Island. It is by no means a town, and today  with the population of Pitcairn below 50  it could barely be called a small village. It consists of a widely spread cluster of houses and gardens, some occupied, some abandoned. These dwellings extend along the path that runs from Bounty Bay along the Edge (a narrow plateau approximately 200 feet above the Bay) and continue westward for about two thirds of a mile. In the center of Adamstown is Bounty Square where one of the anchors of the Bounty is displayed. It was found and recovered by the crew of the Yankee under the command of Captain Irving Johnson in 1957. In the square is also a ships bell which can be heard from far away; various strikes announce a call to prayer or to public work or other community activties; five strikes signify the arrival of a ship. The north side of the square is formed by a long bench where you can sit and socialize or just while the hours away dreaming. One of the unforgettable moments of author Sven Wahlroos life was when the Expedition Flag of his club, the Adventurers Club of Los Angeles, was hoisted on the flagpole in front of the Courthouse in Adamstown on April 17, 1987. Afterwards the Flag was signed by Andrew Clarence Young, the eldest direct descendant of the mutineers  fifth generation from Midshipman Edward Young of the Bounty. Andrew Young passed away on Thursday, March 17, 1988, one month before his eighty-ninth birthday. Everyone who met him will always remember him. BEECHEY, Frederick W. Captain Beechey commanded HMS Blossom in which he visited Pitcairn for sixteen days in December 1825. At that time there were thirty-six men and thirty women on Pitcairn; only six remained of the original settlers from the Bounty  five Tahitian women and John Adams who was then fifty-eight years old. Beechey described his visit in Narrative of a Voyage to the Pacific . . . in His Majestys Ship Blossom (1831). His story of the mutiny and of the early history of Pitcairn is considered among the most reliable. This is because Adams  who provided most of the information and had previously told contradictory stories  by this time knew that he would not be taken back to England for trial and therefore had no reason to consciously distort facts. Beechey saw, and partially copied, Edward Youngs journal which soon afterwards became lost. BELCHER, Lady Diana Lady Belcher, nee Jolliffe, was born in 1806 and became the stepdaughter of Peter Heywood. She married Admiral Sir Edward Belcher, who as a lieutenant visited Pitcairn Island in 1825 on HMS Blossom, commanded by Captain Beechey. Upon the death of her stepfather she inherited one of the Morrison manuscripts (perhaps two). In 1870 she published The Mutineers of the Bounty and Their Descendants in Pitcairn and Norfolk Islands. She died in 1890. HMS BRITON British warship of 44 guns and with a complement of 300 officers and men, commanded by Captain Sir Thomas Staines. The Briton and her consort HMS Tagus were on a mission to track down the U.S. Frigate Essex, under Commander David Porter, which had been attacking British shipping in the Pacific, when they sighted Pitcairn Island in the early morning of September 17, 1814. After establishing contact with the inhabitants they left the island the same evening. On board the Briton was Lieutenant John Shillibeer who later wrote a narrative of the voyage. BUFFETT, John Buffett was an English sailor born in Bristol on July 16, 1797. On December 10, 1823, he arrived at Pitcairn aboard the London whaler Cyrus. When John Adams, the only surviving mutineer, asked Captain Hall if one of his crew could stay on the island to help with the education of the children, Buffett volunteered; one of his shipmates, John Evans, jumped ship and also remained on Pitcairn. They were the first immigrants on Pitcairn since the arrival of the Bounty almost thirty-four years earlier. Exactly two months later, on February 10, 1824, Buffett married Dorothy (Dolly) Young, daughter of Edward Young and Christians widow, Mauatua. She bore him five sons. On the side, however, he was intimate with Mary (Big Melly) Christian, the daughter of Thursday October Christian and Tevarua. She bore him first a daughter and later two sons. The daughter was born after Adams died, so the old mutineer  who professed to have become very religious  may well have regretted that Buffett had stayed on the island. During the Hill dictatorship on Pitcairn 1832-1837 (see PITCAIRN ISLAND and HILL, JOSHUA) Buffett was sentenced to three dozen lashes (he received two dozen, necessitating his taking to bed for two weeks) and was ordered off the island. Hills excuse for imposing this punishment was Buttetts extramarital relationship with Big Melly. Buffett (together with John Evans and George Nobbs) sailed to Tahiti in March 1834 on the whaling ship Tuscan. He returned three months later in the barque Pomare in order to pick up his family; they settled on Tahiti for the time being, from where Buffett wrote to the British Government about Joshua Hills usurpation of power on Pitcairn. On September 16, 1834, being certain that Hills rule would now be short-lived, Buffett and his family returned to Pitcairn on the American brig Olivia. John Buffett died on Norfolk Island on May 5, 1891, at the age of ninety-five. CARTERET, Philip Carteret (1738-1796) sailed as first lieutenant of the Tamar in Bryons expedition; as captain of HMS Swallow he accompanied Samuel Wallis on his expedition to the South Seas 1766-1769; his Account of a Voyage Round the World in Hawkesworths Account of the Voyage by Byron, Wallis, Carteret, and Cook was published in 1773. Captain Wallis in HMS Dolphin and Captain Carteret in the sloop Swallow encountered heavy storms in the Straits of Magellan and spent four months before they reached the Pacific on April 10, 1767. On the following day, however, the two ships became separated in a fog and the Swallow was thought to have foundered. Actually she had been saved by Carterets superb seamanship and sailed westward on the 25th parallel south of the equator. Carteret is important in the story of the Bounty, because on July 2, 1767, he discovered Pitcairn (which he named for the young midshipman who had seen the island first). It was Cartarets account of this discovery in Hawkesworths Voyages that persuaded Christian to look for Pitcairn as the ultimate hide-out. The island turned out to be even more ideal for this purpose than Christian could have hoped, because Carteret had put its position more than 200 miles west of where it actually is! Sir Peter Buck (Te Rangi Hiroa) says in his small but excellent volume Explorers of the Pacific (1953): Though Carteret added little to Polynesian discovery, his voyage was one of the pluckiest in history. Not only should the Swallow have been relegated to the scrap heap instead of being sent out on an expedition, the Admiralty has refused to supply Carteret with an anvil and other and other equipment for repairs. The story of how he circumnavigated the world in a leaky tub and kept her afloat for two years and seven months will ever remain a record for endurance, courage, and skill. CHARLES DOGGETT American brig, a 110-ton whaler from Salem commanded by Captain William Driver. The Charles Doggett carried the Pitcairners back to their island from Tahiti after the disastrous emigration attempt in 1831 (see PITCAIRN ISLAND). CHRISTIAN, Parkin Parkin (George Parkin Christian) is a direct descendant of Fletcher Christian. In 1933, Parkin Christian brought up the rudder of the Bounty from six fathoms of water. CHRISTIAN, Tom Tom (Thomas Coleman Christian), M.B.E., was for many years the radio officer on Pitcairn Island; he is also a ham radio operator (VP6TC), and long-time Elder of the Pitcairn Island Seventh-day Adventist Church. He is the son of Fred and Flora Christian and is married to Betty Christian. Tom is an honorary member of the Adventurers Club of Los Angeles. HMS COMET British sloop-of-war commanded by Captain Alexander A. Sandilands. The Comet escorted the transport barque Lucy Ann which moved the population of Pitcairn to Tahiti in 1831. CYRUS A British whaler from London commanded by Captain John Hall. The Cyrus called at Pitcairn on December 10, 1823; two of its crew, John Buffett and John Evans, became Pitcairns first immigrants since the arrival of the Bounty almost thirty four years earlier. DRIVER, William The commander of the Salem whaler Charles Doggett. Captain Driver has gone down in history for two reasons: (1) He transported the sixty-five survivors of the disastrous 1831 migration from Pitcairn to Tahiti back to their home island. The ship was so small (110 tons) that Captain Driver slept on deck during the voyage (August 14 to September 4, 1831) in order to accommodate his passengers. (2) Captain Driver is said to have originated the term Old Glory for the American flag. ELLIOTT, Russell Captain Elliott is important in the history of Pitcairn in that he helped establish an island government after the infamous dictatorial reign of the imposter Joshua Hill. Elliott arrived at Pitcairn in November 1838 as commander of the British warship Fly. He formally declared the island to be under the protection of the British Crown on November 29, 1838. A unique feature of the regulations drawn up by Elliott was that women were given the franchise. Pitcairners, then, was the first political entity in the world where women were guaranteed the right to vote. It was also the first to institute compulsory education. EVANS, John At the age of nineteen, John Evans arrived at Pitcairn on December 10, 1823, aboard the whaler Cyrus of London. When his friend and shipmate John Buffett volunteered to stay on Pitcairn to help in the education of the children, Evans hid on the island until the Cyrus had left, thus becoming one of the two first immigrants since the arrival of the Bounty almost thirty-four years earlier. On November 26, 1824, Evans married Rachel Adams, the daughter of John Adams and Vahineatua. She bore him three sons and three daughters. Joshua Hill, the dictator on Pitcairn from 1831 to 1837 (see PITCAIRN ISLAND and HILL, JOSHUA), tried to persuade Rachel to leave her husband and to live with him instead, which infuriated both her and Evans. Later, when Evans requested a copy of Hills laws for the island, the dictator flew into a rage and sentenced him to one dozen lashes. Together with John Buffett, Evans left Pitcairn in March 1834 for Tahiti, returning three months later to pick up his family. For the time being they settled on Mangareva, 300 miles northwest of Pitcairn, together with George Nobbs and his family. After Nobbs had received a petition from the Pitcairners asking for his return, they all sailed for their home island on the American brig Olivia, arriving on October 13, 1834, against Hills violent protests. FENUA MAITAI Tahitian for Good Land, the name the Polynesian companions of the Bounty Mutineers gave to Pitcairn Island. HMS FLY British warship commanded by Captain Russell Elliott; arrived at Pitcairn in November 1838. See ELLIOTT, RUSSELL.